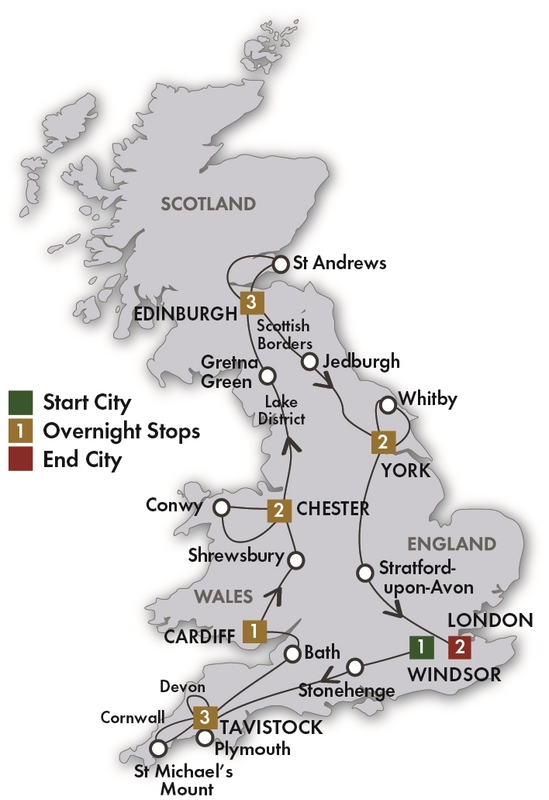 Two week escorted tour from London, Devon, Cornwall (See Lands End), Wales and through England to Scotland. Edinburgh and St. Andrews, ending in London. Our 15 Day Highlights of Britain tour belongs in the British travel hall of fame! With 2 and 3 night stays in most locations, there is plenty of time to explore the iconic sights of London, Bath, Stonehenge, Cardiff, York and Edinburgh. Fill your British travel mug with your favorite drink and enjoy fish ’n chips in the quaint coastal village of Whitby or walk and browse the used-book capital of Hay-on-Wye. Tell a British travel joke to the town crier in Shewsbury and see if he laughs. It’s a classic fun filled adventure. See the highlights of Great Britain in two weeks. Drive south from Edinburgh stopping in Jedburgh for a look around the town and see the picturesque ruins of Jedburgh Abbey. Continue south to York for a walking tour to appreciate narrow streets, especially the Shambles, where the medieval houses almost touch from one side of the street to the other. Visit York Minster, which dominates the city center and is famous for its stained glass windows. In the evening dine in a centuries-old pub with plenty of atmosphere. Reserved seats for Royal Edinburgh Military Tattoo on July 29 to August 12 departures.